Plush toys are usually meant to offer a cute-ish interpretation of character, but these Age of Ultron plushies end up looking really strange — all thanks to the addition of a nose to (most of) their faces. Gaze into the cold, nosed faces of the Avengers! 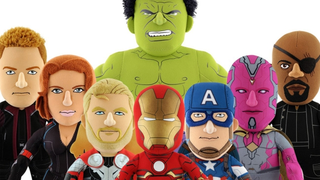 These "Bleacher Creatures" versions of Earth's Mightiest Heroes are 10" tall, and are actually pretty nifty representations of the Avengers, albeit with some questionable additions (Thor's hilarious felt facial hair and Black Widow's... well, plush chest). But the addition of weirdly comical 3D noses — which most plush toys tend to skip in the name of cutesy-fication — turns them from adorable Avengers to vaguely creepy toys. Why is Nick Fury's nose a shade lighter than the rest of him? Why does's Vision's honking pink nose disturb me so? That said, I like that they all have slightly different noses. That's a bizarre commitment to accuracy. Of course, at least Iron Man skips the nose. Although I wouldn't put Bleacher Creatures to attach a golden nose at some point! Each Avenger Plush will set you back $20 when they release in May, just in time for the movie. You can currently order them all as a bundle to save some cash, if you want a complete collection of Nosed heroes, So weird.